With Jupiter now well placed and a bright moon preventing serious deep sky I thought I would have another try at some planetary imaging and getting to grips with the Registax software. As usual the seeing looked quite poor but after a bit of patience a calmer spell arrived around 2am which coincided with the Red Spot being nicely placed. It was good to see both equatorial belts have returned to normal since I last attempted an image of the planet. Although my fast Newtonian is hardly the ideal planetary instrument it does seem capable of yielding a reasonable result at times. This is a stack of the best 800 frames taken from a 2000 frame video. Details: 10"Newtonian F4.3, Canon 550D with EOS Camera Movie Record using 2x Barlow together with a 2x teleconverter processed in Registax, FIV & XAT. Fantastic Pete. Must be the best DSLR planetary pic I've seen. Specially with the short fl. I second that. There's so much detail in the image it's almost tangible. It's a really impressive image. 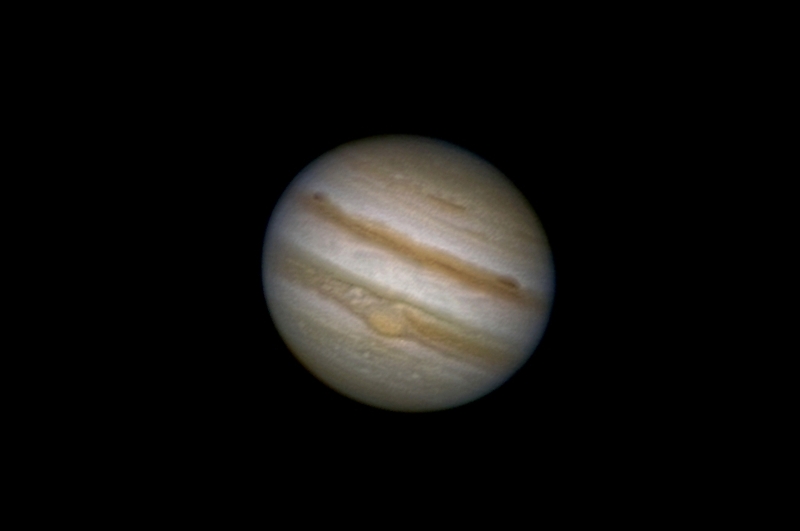 I spent a few hours imaging Jupiter with a webcam earlier in the week. Despite collecting over 100,000 frames my results were very disappointing. If it was easy it wouldn't be anywhere near as much fun! Thankyou for your positive comments John/Simon....It's a pity that periods of good seeing seem so hard to find.